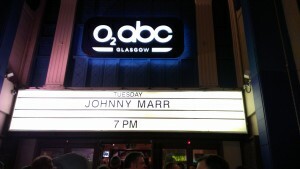 The ABC Glasgow is packed tonight and the crowd are in fine form chanting “JOHNNY, JOHNNY, JOHNNY F***ING MARR!” Rising to a crescendo, the man himself takes the stage with his band for his first solo tour as a frontman proper, following the recent release of his solo debut album, The Messenger . “My mum won’t like that, but I do” retorts Marr and it’s clear he’s in the mood to enjoy this show as he launches into the lead track from the new album, “The Right Thing Right” quickly followed by one of many Smiths classics played tonight, “Stop Me If You Think You’ve Heard This One Before”. This receives rapturous applause from the audience. All songs from the new album, bar one, are aired tonight which is good as for the most part it is a strong collection of songs, and in the case of New Town Velocity, up there with any of his earlier classic work with The Smiths. Halfway in and another great Smiths track, the raucous and evocative “London” (the B-Side of Shoplifters Of The World Unite) is brought back to life. This emphasizes one of the main points about The Smiths, a classic singles band, that to them, every detail from artwork, to how the band were mentioned on the sleeves, B-Sides mattered enormously. The fact that one of their greatest songs, “How Soon Is Now?” began life as a flip-side is testament to the effort that they put into each and every detail of their career. The band encore with a cover of a cover, The Clash’s definitive version of “I Fought The Law” followed by “Getting Away With It” from Electronic, the band Marr formed with New Order’s Bernard Sumner in the late 1980s. The best however is saved to last as Marr and his band deliver a beautiful rendition of “How Soon Is Now?” and end on the brilliant “There Is A Light That Never Goes Out” conveying wonderfully the feelings of longing and escape that encapsulated so many songs by The Smiths.